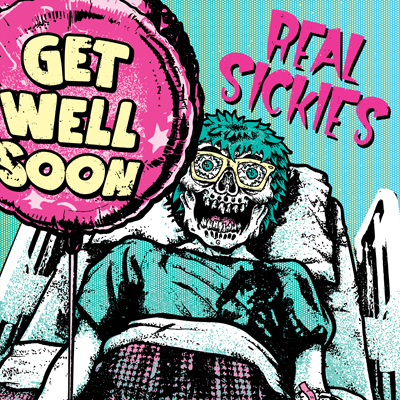 Real Sickies "Get Well Soon"
Get Well Soon is the first full-length album from Alberta Canada's Real Sickies. For those new to the band, imagine modern day power pop punk rock n roll with a foundation set to the classics of Teenage Head and Ramones and nods of respect to 90s punkers The Briefs and The Smugglers. On Get Well Soon, Real Sickies bring it on every jam with high energy vocals, catchy hooks, infectious melodies, and plenty of gang vocals and handclaps in just the right places... and don't forget about the killer saxaphone, kazoo, piano and organ action throughout! Substance always bests style, but when the two come together as slick as they do on Get Well Soon, you know you're in for real sick treat.